A vessel’s bilge or engine compartment blower is the most important ventilation source for boats with gasoline engines. Bilge blowers remove combustible fumes from closed spaces to the open atmosphere, avoiding conditions that could cause an explosion and serious injury to passengers. Simply stated, lives depend on blower operation. Understanding the configuration of a vessel’s ventilation system and how it works is vital to safe boat operation. Boaters should take focused steps to ensure they understand how the system works, utilize it before departing on voyages of any length, and perform regular maintenance. Not knowing what noxious fumes may remain inside a vessel following the boat’s last use makes using the blower a critical first step before engine start. This article describes the basic types of bilge blowers and boat ventilation systems, offers tips for system use, and discusses carbon monoxide issues. On many vessels, the bilge and engine compartment are the same or adjacent to each other, so are treated as the same in this article. By definition, the bilge is the lowest, innermost part of a ship's hull and one of the locations on a boat where noxious fumes accumulate. Basically, boat ventilation systems remove flammable fuel vapors from the bilge and engine compartment by circulating fresh air into these areas. Blowers move air in two ways: some use a round, cage-like configuration or an "in-line" design utilizing a small fan. They are ignition-protected to prevent sparks and built to resist corrosion and immersion in salt or fresh water. The size of the blower is based on the volume of the engine compartment and rated by how much air it moves per minute, measured in cubic feet per minute (CFM). 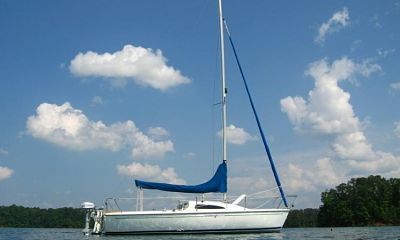 A mechanical ventilation system is required on all non-open boat types built after July 31, 1980 with a below deck engine compartment or fuel tank and using gasoline. Because the blower system is mostly below deck and out of view, its operation before engine start is often overlooked. This can cause death or injury to passengers and serious damage to the vessel, as well as to surrounding boats and docks. AND CHECK ENGINE COMPARTMENT FOR GASOLINE VAPORS. Coast Guard and other federal regulations require all recreational boats that use inboard or inboard/outboard engines for electrical generation, mechanical power, or propulsion be equipped with a powered ventilation system. Boat manufactures follow strict, federally mandated specifications during vessel construction. As long as a system is not altered, and maintenance and cleaning are performed regularly, the system will work as designed. The blower should run for four minutes as a matter of habit and as part of the regular, pre-departure routine before the engine is started, whether the boat has sat overnight, or after lengthy periods of no use or short cruises. Before engine starts, one should also rely on the world’s most sensitive odor-detector — the nose — to detect gas fumes. The bilge blower should also be used on boats with propane-powered grills or ovens, as propane is heavier than air and can accumulate in below deck spaces. Many boaters will also run blowers immediately after a voyage until the engine has cooled, which helps keeps fumes out of cabin spaces. In addition, some boaters will continue to run the blower during a voyage, which allows the engine to operate at cooler temperatures. Of course, the blower must also be activated after refueling and before the engine is started. During refueling, all cabin windows, portholes, and hatches should be opened to dissipate any accumulated fumes. Replacing or repairing ventilation system equipment is best performed by certified technicians. However, if a do-it-yourself approach is used, it is critical to use only equipment (blower, connection hardware, hoses, etc.) that is rated for a marine environment. It is also important that a replacement blower has the size and capacity adequate for engine compartment/bilge area size. There are two types of ventilation systems: natural and powered. A natural ventilation system has a supply opening located on the exterior surface of the boat, which captures outside air and moves the air through below deck areas as the boat moves through the water. As the air passes through the bilge, it carries engine fumes into the atmosphere out through an aft-facing exhaust duct. The other type, a powered ventilation system, uses electric blowers, ducting, outlets, and hoses to remove gas fumes. Keep the engine tuned to minimize oil leaks and wipe up spills, drips and splatters immediately. Check that clamps and filters are sealed properly and inspect hoses and belts for cracking. If replacing hoses, ensure they are the correct length; hoses that are too long or stretch to fit can kink or collapse. 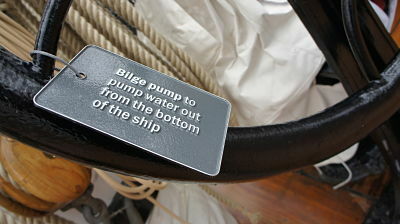 Place an oil-absorbent pad under the engine and an absorbent sock around (but not interfering with) the bilge pump. Many oil-only absorbent products can make bilge cleaning easier. Some absorb only oil and leave water behind; others contain microbes that “eat” the oil. An alternative to managing dirty bilge water is an inline bilge filter, which removes fuel/oil from the water without restricting pump operation, allowing for clean discharge. Bilge cleaners can be a tempting solution to an oily bilge, but many simply suspend oil in the solution; both then need disposal. Boat owners and charterers are responsible for ensuring that all components of the vessel’s ventilation system (active and passive) work as intended. Keep all vent openings, cowlings, etc. free of obstructions, and be sure that below deck ducts are not blocked or damaged. For powered ventilation systems, check the blowers for proper operation, and replace worn components with parts approved for marine use. On diesel-powered boats, engine compartment ventilation is less of a concern because diesel fumes are far less combustible than gas fumes. However, diesels need enormous amounts of air. Blowers that force it into the engine compartment increase the air volume going to the engine. Powered ventilation systems for diesels are generally not federally required, but certainly a good idea. Any discussion of bilge/engine space ventilation should include information about the “silent killer” — carbon monoxide. The colorless, odorless, and tasteless gas results from the incomplete combustion of gasoline or diesel fuel and is as deadly on the water as it is on land. CO is controlled with a constant flow of fresh air throughout a boat. The effects of carbon monoxide are cumulative — exposure to even low concentrations can accumulate in the blood and, over time, will cause serious health issues or even death. Carbon monoxide becomes dangerous when the gas becomes trapped inside a boat and is not flushed. For center console and pontoon boats, runabouts, and similar open-deck vessels, carbon monoxide is not a critical issue, as these boats have a constant flow of fresh air. On boats with inboard/outboards, stern drives, and cabins, however, the concern skyrockets. Exhaust fumes can enter a boat through any opening, especially when underway with a following (stern) wind, which pushes exhaust fumes into enclosed spaces. An open foredeck hatch, port, or front-facing window allows fresh air to dissipate and exhaust the gas. Install a marine carbon monoxide alarm system and test before every voyage. Know carbon monoxide poisoning symptoms (headache, nausea, fainting, drowsiness, or dizziness) and advise passengers about the symptoms. Before every voyage, with the engine running, look and listen for exhaust system leaks and visually check connection points for tightness, discoloration, corrosion, or stains. Ensure that hatches, ports, and windows operate properly. Make sure ventilation system openings work properly and are not obstructed. When docked adjacent to boats running engines or generators, or when rafted to other boats, be certain that the exhaust from the vessels flows into open air. Avoid swim platforms or swimming near a boat when the engine or generator is running. 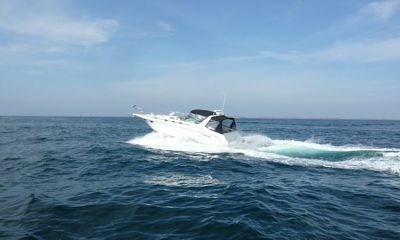 Always maintain the boat at peak performance to reduce the risk of CO production. Boaters should focus on understanding ventilation system configuration and operation before departing on voyages of any length. Neglecting to activate the blower before engine start can cause death or serious injury to passengers and damage to a vessel, as well as to surrounding boats and docks. Lives depend on blower operation.